Hampshire Mezzanine Floors has been in business for over 30 years and our portfolio has developed to include national accounts as well as smaller, local businesses. 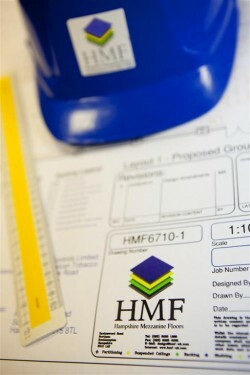 Started in 1985, HMF began as a small firm that specialised in the creation of mezzanine floors for business premises. Since then, we have expanded to the point that we now offer a complete solution, undertaking building regulations and planning applications on a regular basis. Hampshire Mezzanine Floors works mainly on industrial warehouses and factories, retail and trade premises, but also on offices as well. As a principal contractor, we meet every stage of your requirements, from planning to implementation. At the start of your project, you’ll find that we employ an in-house design team who will get the best out of your available space and ensure the whole operation is as efficient as possible. This also saves you valuable specialist design costs in the process. On top of that, we have over 10 years’ experience of project managing huge accounts, allowing us to use competitive systems which will save you money. Our vast experience also means that we can ensure there is minimal disruption to the day-to-day running of your business, while still helping you to maintain a functioning workforce. Our project managers will ensure everything runs smoothly during each stage of the work, giving you the best possible service. You can also be guaranteed that, with an ISO 9001:2000 accreditation under our belts, HMF has a commitment to quality for every project we work on nationwide. Our customers come first and we see them as our most important asset. We like to think of ourselves as a caring organisation that has the best interests of our customers at heart. We’ll look after you in every eventuality, in keeping with our philosophy that is centred around excellent customer care. If you are nearby any of these counties and are looking to maximise the space you have available in your premises, mezzanine floors are the perfect solution. Whether you want more storage, office space, room for production or have a specific set of retail needs, you can be sure that HMF can meet your needs. Give us a call now on 02380 631888 to find out more and get a quote. You can follow Hampshire Mezzanine Floors on Facebook, Twitter, LinkedIn, YouTube, Google + and Pinterest as well as keep up to date through our RSS news feed.